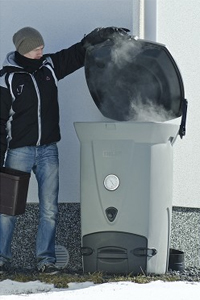 If you are composting biowaste throughout the year, you need a thermally insulated composter. In the Biolan Fast Composter a urethane layer five centimetres thick also covering the bottom takes care of keeping in the heat. The presence of thermal insulation does not mean that the outside air temperature would not affect the temperature of the composter. As the weather gets cold, the composter also cools down. Decomposing continues also when it is cold, but slower than when it is warm. Decomposing does not stop completely until the mass freezes. 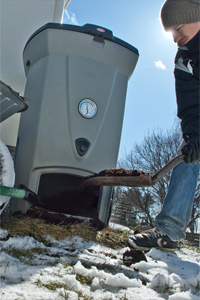 Freezing neither harms the composter nor the compost mass, but the composter fills up sooner than normally. The best way to keep the composter in operation is to bring waste to it regularly. That is how the decomposing organisms are continuously provided with nutrition, and the heat that they generate keeps the process running. If the compost is at risk of freezing, you can heat it, for example, by putting a canister filled with hot water on top of or inside the compost mass. Using bedding is important even in winter. Without it the waste packs up too tight and, after the air again warms up, decaying starts to cause odour problems. You can adjust the ventilation of the Fast Composter using the adjustment disk above the emptying door. In winter the decomposing slows down, which means that consumption of oxygen in the composter is also reduced. Therefore, the adjustment disk can be in such a position, where the widest part of the adjustor (at the figure 20) is pointing upward. Then the air opening is only 20 % open. The Fast Composter can and should be emptied even in winter. The emptied compost can either be put directly around the roots of the plants or in a heap to wait for the spring.